When you read enough articles written by people who take this view, you eventually start to feel like you’re deficient in every vitamin and mineral that exists and that you need to practically go bankrupt buying out the entire A-Z supplement aisle at the health food store. On the other side, you have people saying that we should get all of our nutrition from food because supplements are isolated substances unlike the vitamins and minerals in foods that have naturally-occurring cofactors and other nutrients along with them and are more easily recognized and absorbed by the body. There are a lot of different factors to consider when it comes to deciding whether or not to take supplements, and since each person is different, supplements may be helpful to one person but not the best option for someone else. If you’ve been wondering whether or not you should be taking supplements, here are a few things to think about to help you make your decision. 1) Supplements are a relatively modern trend. It wasn’t until just the last century that supplements really started becoming more popular. 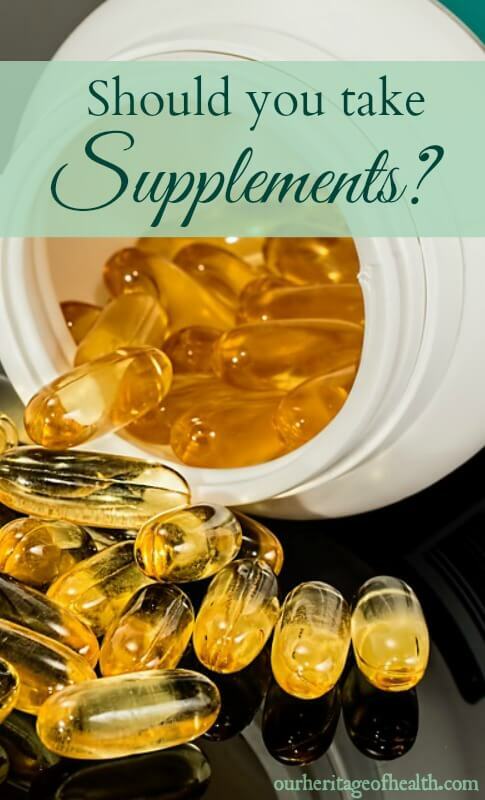 The fact that supplements are fairly new doesn’t necessarily mean that they’re bad or good, of course, but it’s just something to think about. The right supplements can be a good addition to a healthy diet, but it can also be easy to rely on supplements for the nutrition that we need rather than focusing on eating a variety of healthy foods. Popping a multi-vitamin once a day isn’t going to be the best for your health if you’re using it as a free pass to eat all the junk food you want. 2) Supplements vary a lot in type and quality. When it comes to taking supplements, you want to make sure you’re getting ones that are good quality, especially since supplements can often be a bit on the pricey side. Supplements can vary a lot in quality, though, and it’s not always easy to tell just by looking at them. The word “natural” isn’t always a guarantee that the supplements are the quality that you want, unfortunately. Vitamin C, for example, can come from a whole food source such as rose hips or acerola cherries that are processed at low heat to preserve the vitamin content or Vitamin C can also be synthetically produced from genetically modified corn (which can still be marketed as “natural” since corn is a natural ingredient). 3) Many supplements are isolated nutrients. Most of the time, when you take a supplement, you’re only getting that one isolated vitamin or mineral. If you take a Vitamin D supplement, for example, you would only be getting vitamin D (unless the supplement you buy has other vitamins added to it, of course.) If you eat some dairy products from grass-fed cows, though, you’re also getting Vitamins A and K2 to help your body to process and use the Vitamin D plus you get other nutrients like Calcium. 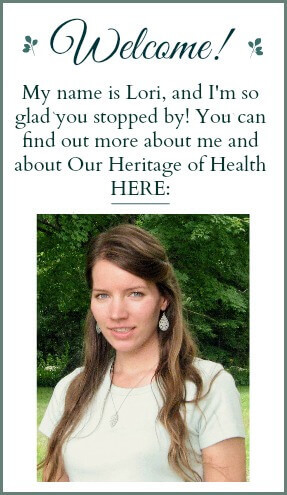 Scientists are continually making more and more discoveries about the vitamins, minerals, enzymes, antioxidants, etc. that are present in the foods that we eat, and man-made supplements aren’t always an equal substitute for the naturally-occurring nutrients in whole foods like fruits and vegetables. 4) How healthy is your diet? Ideally, we would all be eating a healthy, balanced diet that contains all of the nutrients we need to have optimal health. But, if we’re honest with ourselves, that doesn’t always happen. Besides the fact that a lot of produce today is grown in depleted soil that is lacking in nutrients, so much of our modern food supply is full of processed foods that have very little nutritional value. In order to know if you’re getting enough vitamins and minerals from your diet, you have to take an honest look at what types of foods you eat the most often. When you go to the grocery store, is your cart filled with mostly fruits and vegetables (preferably organic ones,) and the ingredients needed for cooking and baking homemade foods? Or is your cart filled with mostly boxes and bags of chips, crackers, cookies, microwave dinners, etc.? Other factors that might affect the amount of vitamins and minerals in your diet are food intolerances, allergies, and taste preferences. If you’re allergic to certain foods or food groups and can’t eat them, or if you just really don’t like the way that some foods taste, it might be more difficult to get the amount of nutrients that you need from food alone. 5) Overall health and health conditions may effect nutrient deficiencies. Your overall health and any health conditions that you have can also have an effect on how well your body is able to absorb the nutrients from the food you eat, especially if your digestive system isn’t functioning as well as it should. And certain vitamins and minerals, like magnesium for example, are more easily depleted than others, too, especially during times of stress or illness. 6) Taking too much of one supplement may create imbalances in other nutrients. The different vitamins and minerals have an intricate relationship with one another, and having too much or not enough of one can sometimes create imbalances in the other nutrients. Because of this delicate balance, it’s a good idea to be careful when it comes to taking supplements because taking a lot of one vitamin of mineral can potentially throw off that balance and cause you to become deficient in another one. Calcium and magnesium, for example, have a proportional relationship to one another, and taking large amounts of calcium through supplements without enough magnesium can disrupt the balance between the two. One of the reasons why you often hear the “talk to your doctor about any supplements you may be taking” warning is because some supplements can have an adverse reaction with medications and can reduce their effectiveness (which could be potentially dangerous depending on the medication you’re taking.) If you’re taking any prescription medications or if you have any health conditions, it’s always best to check first before trying any new supplements to make sure that they won’t have any negative interactions or effects. So, Should You Take Supplements? 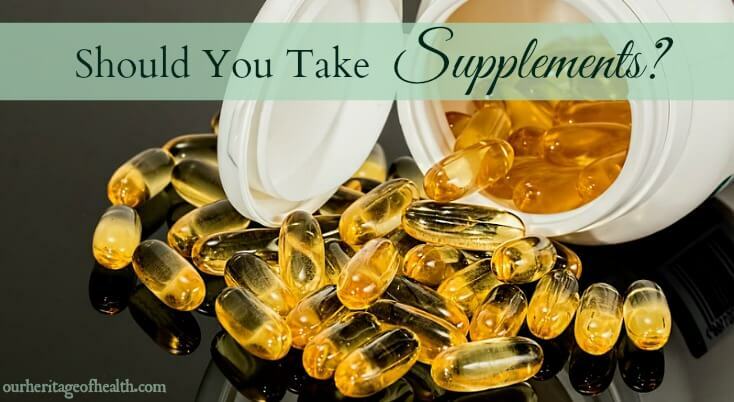 Whether or not you should take supplements is a question that each person has to answer for themselves, and it’s not something that I can give you a “yes” or “no” answer for. I hope some of these points to consider have been helpful in helping you to make that decision for yourself. For me personally, I feel that food is the best and most preferable way to get the nutrients that we need, but I also think that supplements can be a good option for times when we can’t get those nutrients from food alone. If you decide that taking supplements would be a good choice for you, the best supplements to take are ones that are naturally-sourced from whole food ingredients and that are organic and gmo-free. Like I said, I don’t tend to take a whole lot of supplements, but when I do, one of the places that I like to shop at and that I recommend is Perfect Supplements because they focus on high-quality natural supplements that come as close as you can get to getting your nutrients from real food. I enjoyed that balanced post… don’t usually expect the middle ground to be taken. But the issue is not just black or white, you also have to decide at what level of intensity you want to do supplements at. Food is notorious for having sub-optimal nutrient quantities when you go beyond the minimum of just avoiding overt deficiencies (like the classic rickets, beri beri, etc). The RDA isn’t designed to produce optimal health, so if the latter is your criteria, that requires a higher level of intensity. And if you have genetic predispositions to certain disease states, you might need a higher level of intensity than the previous level. And then there is life extension, but that’s a whole ‘nother world.